John Brooke-Little (1927-2006), later Clarenceux King of Arms and founder of the Society, was its Chairman for 50 years. He here gives a personal view of its history, written in 1976. This is a light-hearted account of my personal recollections and sentiments. When I was a schoolboy at Clayesmore, I gathered together some kindred spirits and founded a school Heraldry Society. I wrote and asked Garter Howard if he would become our Patron. He consented and we were in business. We set ourselves the task of compiling a complete pedigree of the Royal Family, illustrated with paintings of arms. What happened to the pedigree I cannot think but I still have some of the painted shields waiting to be affixed to the great roll pedigree. With the self-assurance of the young we called our Society the Society of Heraldic Antiquaries and, modestly, I assumed the title of Clayesmore King of Arms. In 1945 I and most of my heraldic friends left school and the Society fell into desuetude, despite the efforts of the Master of Clayesmore, Peter Burke, to keep it alive. Although a nephew of Garter Burke and a grandson of John Bernard Burke, I imagine that his genes were not strong enough to prevail over armorial apathy. The first three months of 1947 were arctic. I was teaching at a preparatory school in Worcestershire, waiting to take up a place at New College, Oxford. Time hung on my hands and I decided to resuscitate the Society of Heraldic Antiquaries as a society for young, armorial enthusiasts. I invested in some printed stationery, a printed prospectus, a typewriter and a flat-bed duplicator. The bill came to about £30. By May I was ready to launch my new project. The Scout (I think that was its name) and The Children’s Newspaper both gave publicity to the Society and soon about fifty school children had sent me their five shilling postal orders. At this time I was working for the Conservative Party in High Wycombe in an effort, which proved successful, to win the seat for Bill Astor. Time no longer hung heavy on my hands and I found myself banging away at my ancient typewriter into the small hours trying to run my Society efficiently. It was at this point that my parents became involved, as many hands make light work when operating a flat-bed duplicator. Publications began to appear with some regularity. An Introduction to Heraldry, Second Steps in Heraldry and An Introduction to Genealogy were produced within three years. A quarterly magazine, The Escutcheon was started, postal instruction in heraldry was given and heraldic tests were held. Membership increased and many of the members were clearly in their second rather than their first childhood. I went up to New College in 1949 and realised than that I could no longer cope with the Society, my studies and the temptations which Oxford offers and into which it is such fun to fall. My mother came to my rescue. She offered to act as Honorary Secretary. We erected a hut in the garden of our little cottage in East Knoyle and that, for many years, became the Society’s office. We thought that if my mother were to call herself Mrs. Brooke-Little members might come to the false conclusion that she was my wife or the quite accurate conclusion that the Society was a family affair. Neither assumption seemed desirable so she reverted to her maiden and pen name of Constance Egan. Her editorial expertise was soon capitalised, as The Coat of Arms, a serious heraldic quarterly magazine, was first published in 1950, the cover being designed by Nigel Herring. I selected the material for it but “Miss Egan” edited it and continued to do so for fifteen years. It was in 1950 that I received a letter from Sir Christopher Lynch-Robinson, co-author with his brother Adrian of a recently published book Intelligible Heraldry. He told me that he and “a fellow called Scott-Giles” (I had heard of him!) had thought of starting a heraldry society and that they had heard of my modest effort. Would I like to lunch with them at the Marlborough-Wyndham Club. I would; I did. After Sir Christopher had extricated some prawn shell from behind his false teeth (teeth immortalised in his Experiences of an Irish R.M.) we discussed the possibilities of enlarging my children’s society to cater for adults and become a national heraldic society. We decided to call a meeting, form a committee, draft proper rules and change the name of the society to something less pretentious. This we did. Sir Christopher produced rules (based on those of the Noise Abatement Society but none the worse for that), Miss Egan was confirmed in her post of Honorary Secretary and Treasurer (my father did the accounts for her), I was elected Chairman and Messrs. Turner (vide supra), Moreton (a solicitor), Cole (now Windsor Herald), Pine (quondam editor of Burke’s publications and still a prolific author of heraldic and other books), Scott-Giles (who may forgive me if I call him “the grand old man of heraldry”), Williamson (still a keen genealogist), Bellew (Somerset Herald and later Garter), Pereira (still serving), Evans (donor of all illustration blocks, which are still given by his widow) and Merriman (a Naval Commander, now dead) formed the Council. The name was altered to The Heraldry Society and an elegant non-heraldic badge was designed for us by George Bellew. The Duke of Norfolk agreed to become our President and we persuaded a number of distinguished people to become Vice-Presidents. The success of the Society dates from the time of its re-foundation, when so many eminent people began to take an active interest in its well-being. The really wonderful thing, which still surprises me, is that although most members of the first council were people with established names and the authority and judgement which comes with experience, they worked together in complete amity under the chairmanship of a twenty-three year old, very wet behind the ears, undergraduate. Their tolerance, friendship and complete lack of jealousy or intellectual arrogance was the real rock on which the Society was established. I will not apologise for taking this opportunity of recording my humble gratitude. In autumn 1960 my parents left East Knoyle and moved to Swalcliffe in Oxfordshire. The Society, though not the hut, moved with them. The following year my father died, my mother moved to London and the Council of the Society secured a lease of part of the basement of 59 Gordon Square from the National Association of Schoolmasters. This transformed the Society, as we now had an office where people could drop in and where a library could be maintained. The added responsibilities and the demands of a 10 to 6 job became too burdensome for “Miss Egan” and in 1964 she retired, although she did not give up, for she continued to edit the Coat of Arms for a further year. For a short while Mr. Bernard Jackson became Secretary, only to be succeeded in 1965 by Col. C. C. Danby who, ably assisted by Miss Sheleagh White, looked after the Society until his retirement in 1968. He was succeeded as Secretary by Major John Riley, who would probably still be at the helm but for failing eye-sight, which suddenly and sadly overtook him. After he left Major T. Kennedy-Davis was Secretary until May 1973 when the Council appointed Mrs. Linda Biermann. Now, with youth at the helm, we all hope for great things, for never has interest in heraldry been so widespread. That it is often uncritical is no bad thing as it offers the Society a challenge, which I am sure it will take up. In 1969 the University of London, ground landlords of 59 Gordon Square, tried to evict us. Fortunately the wrong order was issued and during the moratorium gained thereby the Council acquired a lease of 28 Museum Street, from which cramped but cosy quarters the Society now operates. Meetings have always been a feature. The first was held in Caxton Hall and was addressed by Sir Arthur Cockrane, Clarenceux King of Arms. I cannot recollect exactly what dear old Cocky said but everyone was thrilled to meet a real King of Arms, especially one who so much looked and loved the part. Other talks followed, many being held at the Interval Club in Dean Street, Soho. Of all our lecturers one in particular must be mentioned as he was an early and true friend of the Society and of so many members, including Francis Jones, and that was Aubrey Toppin, York Herald and later Norroy and Ulster King of Arms. Antiquary, ceramic expert and a fine old Irish gentleman, without a drop of emerald blood in his veins, he was everyone’s friend. “Uncle Strawberry” was that loveable, generous sort of eccentric that everyone should have at his elbow. Whilst he was alive almost everyone had. It was not long before the Council began consciously to appreciate the importance of social contact and the pleasure which it gave. A service called The Register was introduced, by which those willing to correspond with each other were put in touch. In 1955 the first Annual Dinner was held at the De Vere Hotel, Kensington. Cardinal Griffin was guest of honour and I remember with what delight my mother introduced herself as “Miss Egan, the chairman’s mother.” The venue of the dinner has changed — De Vere, Rembrant, Great Eastern and now the House of Commons — but its popularity has never palled. It is a formal gathering of friends, the hub of the Society’s social life. Until 1960, Wilfrid Scott-Giles was Secretary of the Institute of Municipal Engineers and, through his and his Institute’s kindness, we had the use of their spacious rooms in Ecclestone Square. Here we held meetings, parties and Council meetings which, in very early days, had been held in either Sir Christopher Lynch-Robinson’s or Sir George Bellew’s office. Our enjoyment of these rooms did much to foster the family spirit. When the Society was an infant it was identified by a badge consisting of a splendid Germanic eagle designed by Nigel Herring. Why an eagle? I can only answer, why not? In early youth, when the name of the Society was changed, so was its insignia. An equestrian seal type of badge (another elegant and eloquent tribute to the artistic genius of Sir George Bellew) was adopted. Then, when the bloom of youth had left the Society it took itself seriously and, in 1956, was incorporated as a company limited by guarantee, with licence to omit the word “limited”. Few companies can have had such a distinguished list of subscribers — The Lord Great Chamberlain, The Lord High Constable of Scotland (her signature suitably witnessed by the Maharaja Sriraj of Halvad-Dhrangadhra), Garter King of Arms, Somerset Herald and three other gentlemen now Officers of Arms. 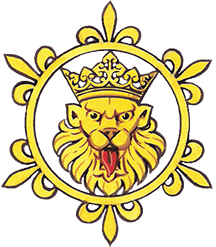 The next year armorial bearings with supporters and a badge were granted to the Society. The design was about seventy-five per cent Bellew and twenty-five per cent Cole and Brooke-Little. The actual Letters Patent were magnificently decorated with the arms of the Kings of Arms and the badges of the other Officers and were painted by Henry Gray, an artist who joined the Society when a boy at school and is, in fact, a founder member. By mentioning Cole I have begged the question, who is Cole? Colin Cole and I met at Oxford and from then on he has been intimately associated with the fortunes of the Society. We were appointed Pursuivants within a few months of each other and so, for most of our ceremonial life, have marched side by side on State Occasions being known, for a reason which has always eluded us, as Tweedle Dum and Tweedle Dee. It is, of course, true that we have fought many battles but, I am glad to state, always on the same side. I think it can now be revealed that Colin Cole, Wilfrid Scott-Giles and I were the principal contributors to the Heraldry Gazette, a quarterly news sheet started in 1957. I would not say that we no longer contribute but the editing of the Gazette is now in other and less occupied hands. It is true to say that the Gazette has, over the years, done much to bring heraldic nonsenses to the notice of the public and even to right heraldic wrongs. Our small crusades have often been reported in the national press and so inspired some positive action. For example, we relentlessly criticised the borough of Congleton for using the arms of the Vintners’ Company of London, believing that although heraldry is and should be fun, it is much more fun if it is done properly. Congleton now has its own, legally granted, coat of arms. In the Memorandum of Association of the Society the objects for which the Society is established are listed. The principal object is “to promote and encourage the study and knowledge of and to foster and extend interest in the art and science of heraldry, armory, chivalry, precedence, ceremonial, genealogy, family history and all kindred subjects.” To this end the Society has built up an excellent collection of slides and also a very fair library. In 1967 it held the first English Heraldic Congress at Worcester College, Oxford. Since then two other Congresses have been held thanks to the organising ability of Mr. F. Humphery-Smith, the father of Cecil Humphery-Smith, a Council Member and devoted supporter of the Society. In recent years the Society has been concerned with the mounting of a number of heraldic exhibitions, including two devoted to the work of contemporary armorial artists. I now seem to be blowing my trumpet which is something a herald should never do. Let me at once disclaim. I am used myself by starting the ball rolling. Others have pushed it along and so it has grown. It has been hard work at times but always fun and I can only hope that all those others who have joined in, or who may do so in the future, will get as much enjoyment out of heraldry and The Heraldry Society as I have, and indeed as I still do.